Sherlock's older and smarter brother, Mycroft Holmes, has been spending his holiday in the countryside, but has been kidnapped by the ever-present Professor Moriarty. He's sketched out an encoded map of the location of his imprisonment and smuggled it out in the pouch of a Carrier Kangaroo, a small and little-known species that plagues old houses in northern Scotland. Can you help Sherlock locate his brother and save the day? Do you still draw breath? Does your finger still twitch on your mouse? Are there NO signs of intelligent life south of the Canadian border??? 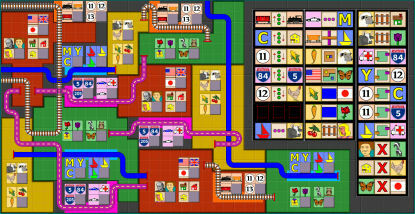 The licensed version contains over 300 different maps with each map giving more puzzles than you can shake a possum at. You must use the graphical clues to deduce which images are located in which areas and in which connections. Can you keep from getting lost, even with a map at hand? NOTE: If you're familiar with Watson's Map, you'll need to adjust your concept of "west-of" and "north-of". In Mycroft's Map, ONLY the LEFT-most edge (for west-of clues) or the TOP-most edge (for north-of) clues determine the truth of these relationships. Please read the Help screen in the game that talks about the clue types. This is possibly the most complex of the Sherlock games, so don't assume you'll be able to just jump right into it without reading about the clues in the Help! The game generates the puzzles as you get to them, but it saves enough information about each puzzle for the program to be able to more quickly generate the puzzle in the future. The ZIP file below contains 'precalc' files for all of the maps that are currently included in the licensed game, with the first 500 puzzles already generated. If you unZIP this file into your PUZZLES sub-folder of the MM folder (C:\EKS\MM\PUZZLES unless you installed the game elsewhere), then the first 500 puzzles in each map will load MUCH faster for you.